Hi to start with I am using classic ASP, when I click the Add/Image button I can't get the browse server button to work properly, I get 'Error 500 xml...' problems when this button is clicked, I beleive this is down to file permissions which I don't have authorisation to change. However I have managed to create a different page called 'Gallery' that allows me to upload images to the server to this directory 'images/gallery'. So what I would like to do is make it possible so that when the user is on the 'Content' admin page, they click the Add/image button, type in the filename of the image (without having to type in the relative path 'images/gallery') into the URL input field, click ok and it automatically adds the correct path to my 'Content' page. 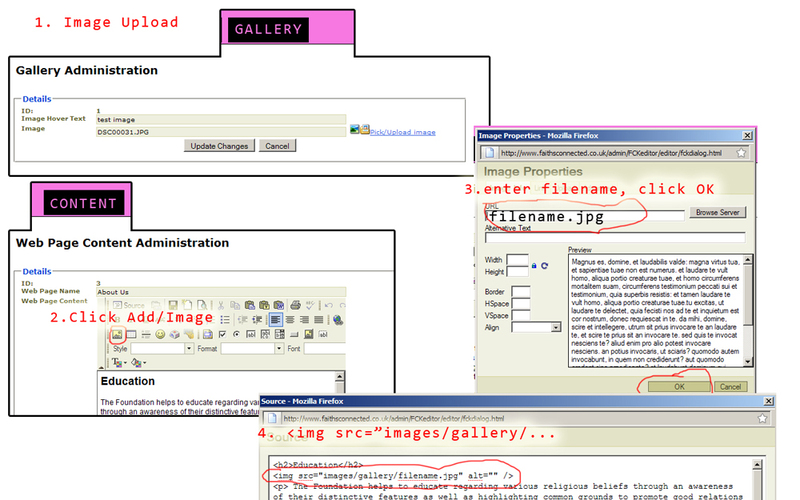 For instance if I was on the fckdialog.html page and I entered 'images/gallery/imagename.jpg' and hit OK it would update the page with this html <img src="images/gallery/imagename.jpg" alt="" /> however I want the user just to be able to enter 'filename.jpg' hit ok and it update the page with the same html <img src="images/gallery/imagename.jpg" alt="" />. I've tried looking but can't find how to change this. If anyone has any help or suggestion then I would appreciate you help greatly.